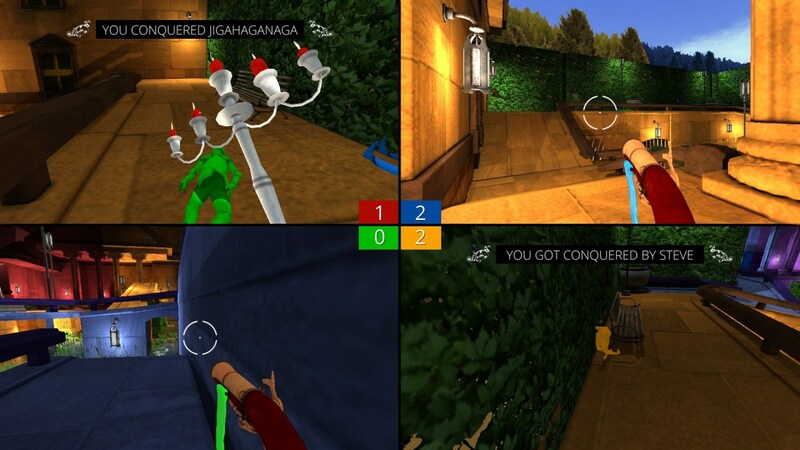 Once upon a time, multiplayer shooters were played offline, with all viewpoints displayed on the same screen. Needless to say, this often lead to so-called ‘screen looking’, as players would cheat to find the location of their opponent. Not cool. What is cool, however, is that the recently released Screencheat actually emphasises this mechanic, because… everyone’s invisible! Because of this clever twist, players have to pay attention to not only their own portion of the screen, but also that of their opponents. Invisibility doesn’t conceal their surroundings, after all, so knowing the lay of the land is – like in most shooters – quite important. In this game, that’s hardly a tricky task, as “uniquely coloured areas” in each level are far more common than, say, landmarks. A good design choice, considering how fast-paced the game is. When everyone’s used to playing by the rules, can you adapt to unconventional gaming quick enough to get the upper hand? Now, some might argue that the eight weapons and five maps with modes mimicking classics like CTF, Deathmatch and King of the Hill is much too little in terms of content. But that’s the thing about Screencheat: it’s not trying to be the next Call of Duty or Halo, with a gazillion of different guns and more modes than most have even sampled. Almost the exact opposite, I’d say, as it looks to be a fast-paced, simple, back-to-basics multiplayer shooter, with a rather unique twist. It’s also one that most will be able to enjoy without first spending hours learning what’s what. And hey, how many other genre entries come with offline multiplayer these days? Exactly. This one has both offline and online. Finally… a game that lets people screen look without being labeled a cheater! Screencheat is available for Windows, Mac, Linux from Steam, Humble Store, and GOG.com where it carries a $14.99 price tag. Update: added GOG.com store link.